CHICAGO (WLS) -- You could call it the breakfast of champions, or at least one champion. 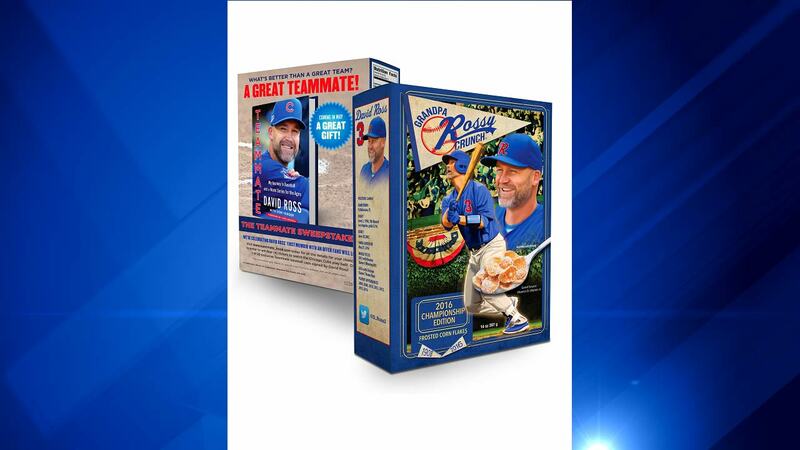 Retired Cubs catcher David Ross is dancing into Chicago area Jewel stores with a new cereal. Now you can pour yourself a bowl of "Grandpa Rossy Crunch" frosted corn flakes. His recently released autobiography, "Teammate," is featured on the box. The book just hit store shelves and there's a plan to turn it into a movie. Ross told the team at GMA He does have a favorite for the lead role. "I met Chris Pratt and he has a huge effect on me. Maybe if he saved his head and they did a little more gray he's buff a little bit you know. I have no idea, but he's a nice guy," said Ross. Besides his new book, Ross is still going strong on "Dancing With the Stars." He said he's already lost about 12 pounds.